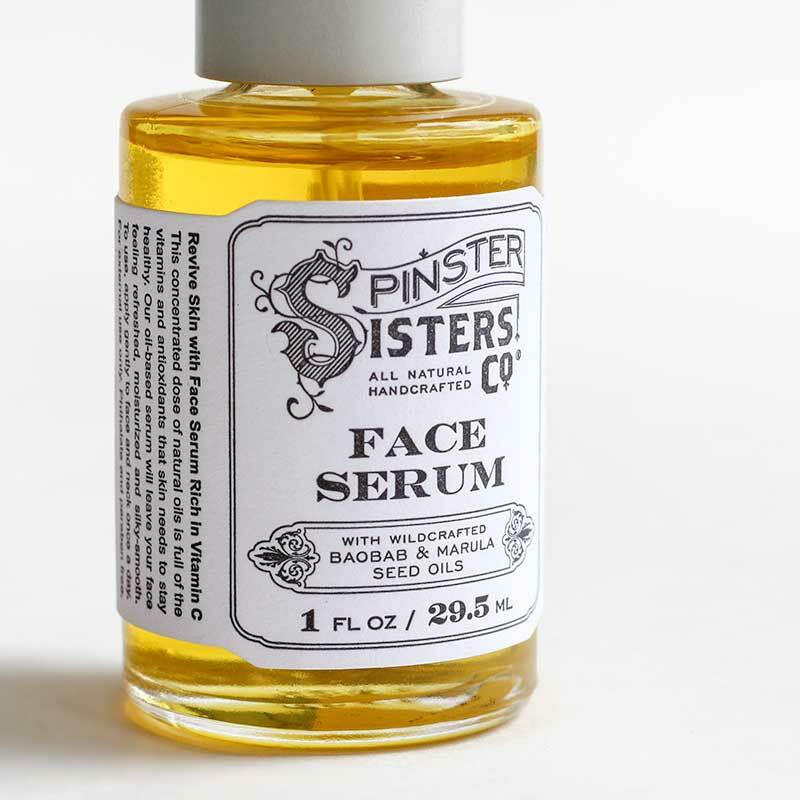 Face Serum | Face Care | Spinster Sisters Co.
Revive skin with our Face Serum rich in vitamin C. This concentrated dose of natural oils is full of the vitamins and antioxidants that skin needs to stay healthy. Our oil-based serum contains pure, active ingredients which absorb quickly and deeply into the dermis to smooth, tighten and brighten skin. It includes wildcrafted and organic baobab and marula seed oils to leave your face feeling refreshed, moisturized and silky-smooth. About Our Face Serum from Founder & Owner Kelly Perkins: "There is a lot of talk these days about the amazing benefits that Vitamin C offers in tightening and brightening skin, as well as its ability to neutralize free radicals in skin. 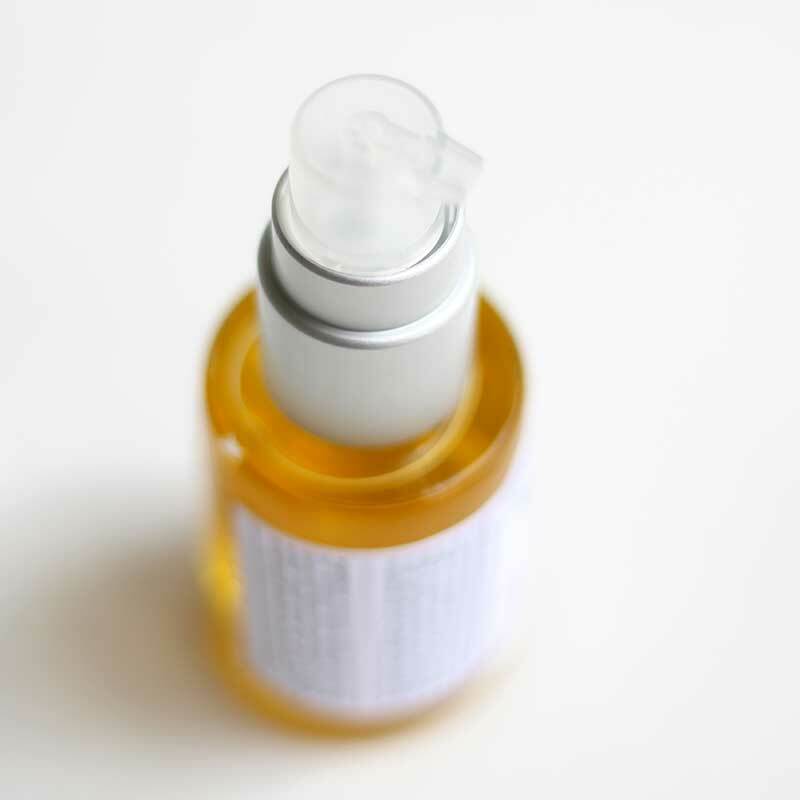 When thinking about our new Face Serum, I wanted to take advantage of the wonderful benefits that Vitamin C adds in skin care, while still focusing on a light, non-greasy alternative to many other serums and creams. Enter our virgin, organic marula and baobab seed oils. Marula seed oil has a higher concentration of Vitamin C than even an orange. It is non-comodogenic, and rich with omega fatty acids that support a healthy dermis. Baobab oil contains more antioxidants than any other fruit on earth, and is rich in omega-6 and omega-9 oils that promote skin elasticity. These two wildcrafted organic oils work in concert to reduce the appearance of fine lines and wrinkles, breakouts, and dry, baggy skin, all while supporting skin elasticity and hydration." Absolutely LOVE this face serum. I am approaching my 30’s so I was looking to combat some areas that are more dry ( hello Colorado dry air!) and also some that are very sensitive. This works so well! And the best part is that I don’t feel like a greasy mess, it tends to soak in quickly. I would say it’s a great option for sensitive/finicky skin like mine. I really love the face serum, especially during the dryer months. Surprisingly, my husband loves it, too. He didn't really use face products before, but now uses the face serum daily. He says he feels naked without it. 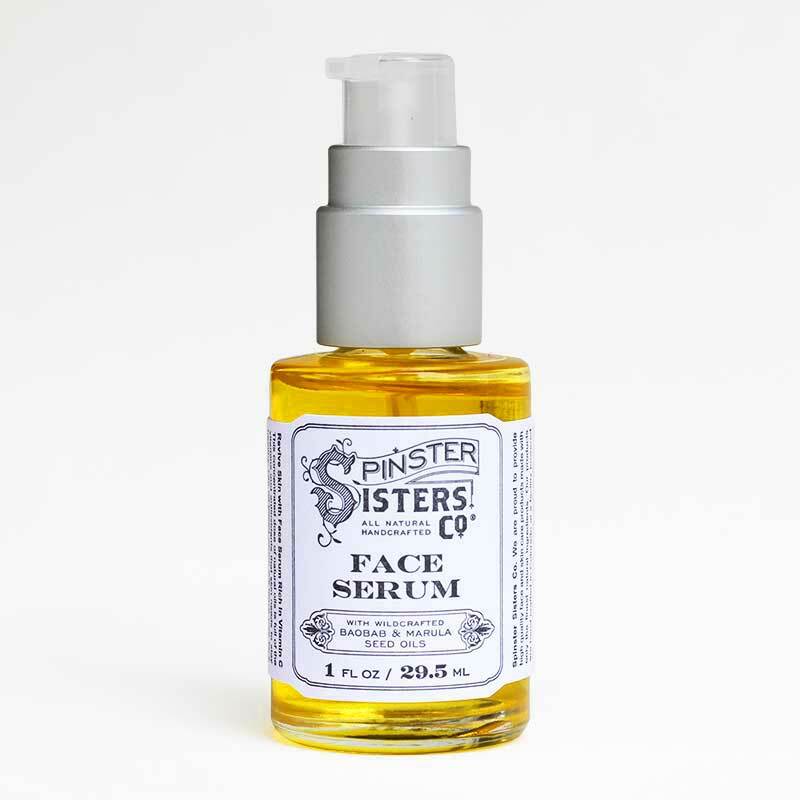 Since using Spinster Sister's face serum, my skin is softer than ever! 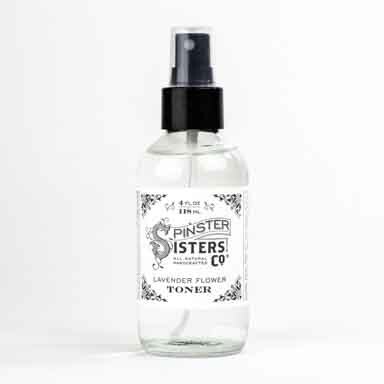 My skin stays very moisturized all day and the serum has a very nice, light, feel. It is also good to know that it is full of skin healthy vitamins. I keep forgetting to tell you that I’m in love with your face oil, It’s fantastic! I use face oil normally, usually Laura Mercier or Sunday Riley. But I love the feel of yours and doesn’t make me greasy like some. Great job on this, super impressed! Bottle made in the U.S.A.
Adansonia Digitata (Baobab) Seed Oil, Sclerocarya Birrea (Marula) Kernel Oil, Simmondsia Chinensis (Jojoba) Seed Oil, Argania Spinosa (Argan) Kernel Oil, Arnica Montana Flower Extract, and Rosa Centifolia Absolute. 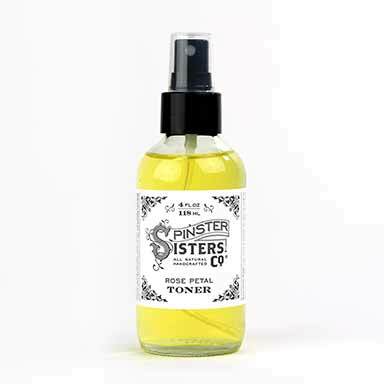 Applying Face Serum to clean, bare skin allows it to penetrate most deeply. 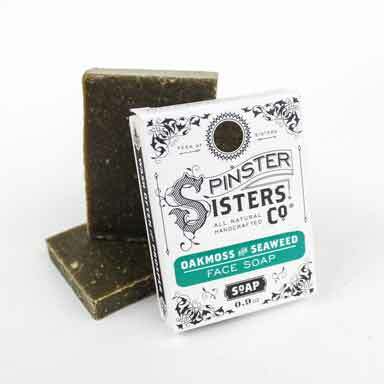 To use, first cleanse face with gentle soap and pat dry, ensuring that no traces of makeup remain. Apply Face Serum gently to face, spreading down to neck if desired. One or two pumps of serum (just a few drops!) is enough to apply a thin layer over skin. It should soak in easily without feeling greasy. For very thirsty skin, follow with our moisturizing Face Cream.